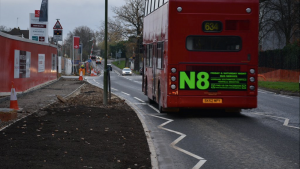 The redevelopment of the old Novartis site in Parsonage Road, Horsham included a promise from the developer to improve the existing inadequate 70cmm cycle lanes. 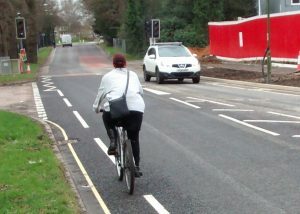 Councillors approved 1.5m cycle lanes on either side of the road but when the road works were completed the existing 70cm lanes had simply been reinstated. We organised a protest and secured a meeting with WS Highways to discuss options for resolving this issue. Following the meeting with WS Highways we were disappointed that the solution is now to remove the cycle lanes altogether! This was an “open goal” – an opportunity where everyone agreed on what was needed yet we have somehow ended up with something that is worse than what we had before. Sadly this is far from a one-off and is merely just the latest in a catalogue of missed opportunities. We need to learn from these mistakes to stop similar problems happening again and again. We need better cycling provision because of the atrocious and rising level of cycling KSIs (Killed and Seriously Injured) on our roads and because badly designed roads prevent adults and children from cycling, with the attendant benefits to our health, economy and society. The current system is broken: it is simply unable to deliver on cycling. WSCC and HDC need to get serious about designing roads that are safe for cycling, including better systems which resolve the current flaws in the safety audit process. Remove the traffic island and install a light-controlled crossing. This would be better for the elderly, disabled and those with buggies etc. and would allow the road to be narrowed which will help slow traffic. Re-align the kerb on the approach to the traffic island by taking a bite out of the grass verge (see picture below). 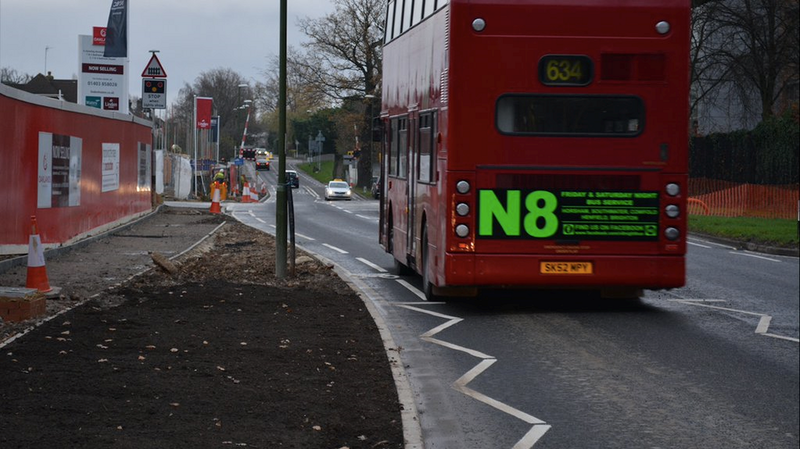 You can read the background on the Parsonage Road cycle lanes here. What are the chances of any cycling provision being included, let alone anything of decent quality? I agree with David. Sub-standard on-road cycle lanes, and cycle logos, are worse than useless. We know this from decades of experience in the UK. London has, at last, taken action to replace dangerous “paint only” cycle superhighways with decent Dutch-style cycleways with kerbs keeping motorists well away from people on bicycles. Brighton is also moving in that direction, with excellent results for the attractiveness and safety of cycling as a mode of transport. WSCC are clearly intent on discouraging cycling at every opportunity. In fact I don’t think it’s an exaggeration to say that WSCC actively hate cycling. This is clear from their actions, their feeble motoring-dominated transport planning documentation, their making the post of County Cycling Officer redundant, their refusal to talk to the West Sussex Cycle Forum (even though this was set up by WSCC many years ago), the refusal of the County Cycling Champion to champion anything other than cycle paths in his own constituency, their refusal to commit to any useful long-term budget for investing in cycle infrastructure, their love of the phrase “where funding becomes available”, their wasting of a couple of million of LSTF funding on awful schemes in Horsham and Chichester, their spending of £4.8 million of sustainable transport funding on repaving Montague Street in Worthing (a project with no transport benefits at all!). They should be ashamed of themselves, but sadly it seems the increase of motor traffic is all that they’re interested in.